People are always going to need jobs. Starting a niche job board can be a great way to reach some of the millions of job seekers out there! More than ever, job seekers go online to find work — an estimated 180 million unique visitors make their way to Indeed each and every month. What if you could get even the smallest slice of the online-job-seeking pie? You could end up making a pretty good living! Many niche job boards charge $50 to $500 for each 30-day job listing posted. Even if you could get 10 new listings a month (to start! ), that’s not too bad for a business that has little startup costs or monthly maintenance fees. You won’t be able to compete with the large job boards like Indeed, CareerBuilder or Monster. That’s okay. You don’t have to. You can carve out a nice little spot for yourself in the job board market by picking a targeted niche. ProBlogger, AuntMinnie, and Dice are all good examples of how a job board can thrive by providing industry-specific jobs to a certain market. So, what kind of niche job board will you have? You can target your local community or focus on a specific industry. You could even establish a job board for certain professionals, say virtual assistants or graphic designers. The kind of niche job board you set up is entirely up to you. It’s a good idea to play to your strengths and pick a profession you are experienced in or have worked in before. Why? To bring in organic traffic to your job board, you’ll want to establish a blog on the site. Blogging is one of the best ways to bring in visitors from search engines like Google and Bing. It also happens to be a great way to get social shares. The more traffic you can bring to your site, the more you can charge for your monthly job listings. Plus, when you provide job listings AND helpful industry-related news and advice, you become an expert source of information as well as a great place to find a job. Without experience or at least an interest in the field, you’ll quickly burn out and lose your gusto before you even get started. That’s why you should aim at an industry you actually enjoy and can provide valuable insight into. Picking a niche for your job board will probably be the hardest part of this process (and one of the most important!). Don’t rush and pick something just for the sake of getting started. Take your time and think of something that actually resonates with you — something you know you can sustain for some time and turn into a profitable business. For a little inspiration, check out this list of 100+ Niche Job Boards. You’ll see that there are plenty of opportunities to launch a job board that is highly focused and targeted — and be quite successful! Got your niche? Great! Now you need to get your niche job board up and running — don’t worry, no technical skills required. First things first, you need a name. Ideally, your name will have something to do with your job board’s niche. This can be an industry term or directly reference the profession. Look at AuntMinnie — it’s a job board for radiology professionals. What does Aunt Minnie have to do with radiology, you ask? It’s a term often used by professionals in the industry to refer to a very obvious radiological finding — something so apparent even your Aunt Minnie could see it! While the term may be lost on most, radiology professionals get it. And so it works! The ProBlogger job board is another very successful example. It’s a go-to spot for those looking for professional blogging and writing jobs — ProBlogger. The name directly references the types of jobs listed and is easy to remember. The takeaway? Choose a name that professionals in the niche you’re targeting will understand OR directly reference the types of jobs being posted. Niche and Name. Now What? You’ll need to purchase your domain name and pick a hosting provider. If you’re new to the world of web properties, your domain name is the actual address visitors use to find your site. Here at Work from Home Happiness, the domain name is WorkFromHomeHappiness.com. Your domain name should be your job board’s name — ideally with a dot com ending. Why? Most people will automatically put a dot com at the end of a web address, no matter what. Don’t miss out on valuable traffic because you opted for a .net, .org, .ninja, .family. Every website needs to be hosted in order to be visible on the internet. Hosting is like your website’s monthly rent — a place for it to live. Like a good or bad landlord, your host makes all the difference in your experience as a website owner each month. That’s why you’ll want to choose a host with reasonable rates and a great reputation. One of the best hosting companies out there is BlueHost. They have 24/7 customer support and make it easy to get your website up and running — all at an affordable monthly price. 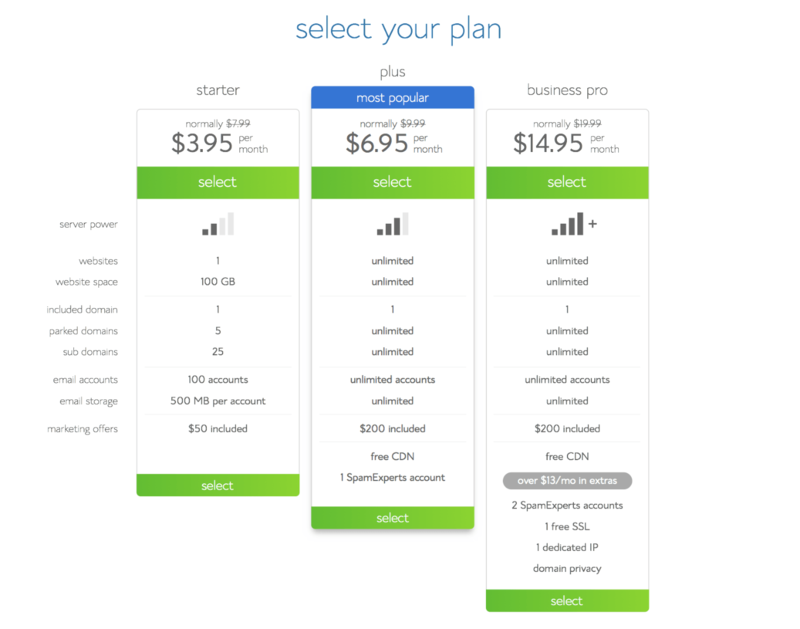 When you sign up, you get a free domain name to go along with your hosting plan. This eliminates the confusing step of buying a name somewhere else and then transferring it over to your host. Ready to get started? Before you do, I suggest setting aside one day to devote to this process. That’s it. Just one day. 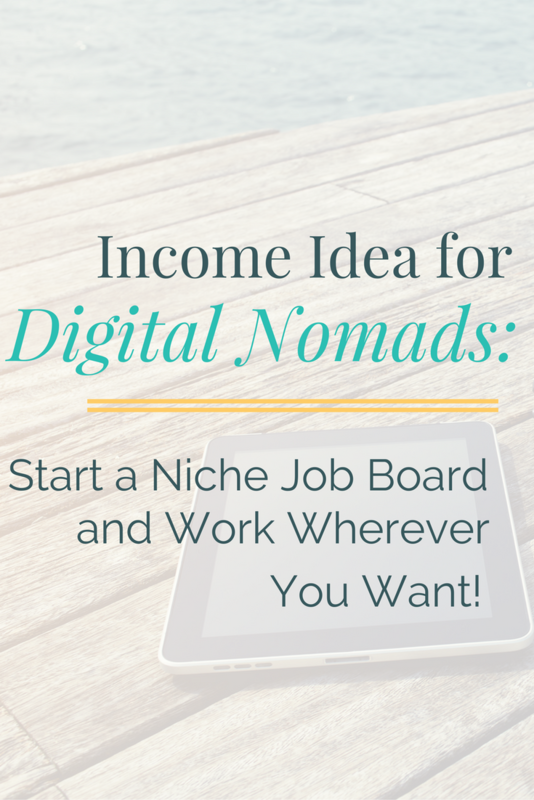 How can you get your own niche job board set up in just one day? WordPress. When you choose WordPress for your job board, not only can you get up and running quickly, but you also get a very professional and functional site. The best part? You can do it all yourself. You don’t need any special skills or coding knowledge. Using a WordPress theme and a combination of plugins, you really can quickly and easily get your job board set up by the day’s end. When selecting a plan, the Starter Package will have everything you need (and more!) This package comes with your domain name, email accounts (YourName@YourWebsite.com), and even $50 worth of marketing offers. Now that you’ve picked your plan, type in the name you carefully selected for your job board in this screen. As I mentioned, when you sign up for BlueHost, you’ll get a domain name completely free. In the event you already purchased a domain name elsewhere, no problem! You can transfer it over to BlueHost. Make sure you provide up-to-date contact information. 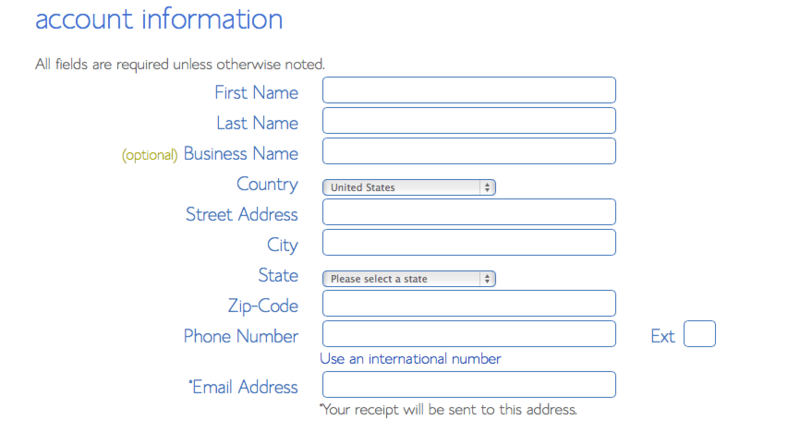 This is how BlueHost will relay important account information to you. The next page will ask if you’d like to add any additional items to your monthly hosting package. In all honesty, you don’t need any of these things. They are all completely optional. Note: Whenever I purchase a domain, I always opt for Whois Privacy. Why? Every domain that is purchased goes into a database. This database stores information about the domain, including contact information of the owner. Whois Privacy Protection keeps your personal information hidden from public view. You don’t need it but it is a nice option if you prefer to keep your information private. When you’ve selected the options that make sense for you, it’s time to make yourself an official domain owner. 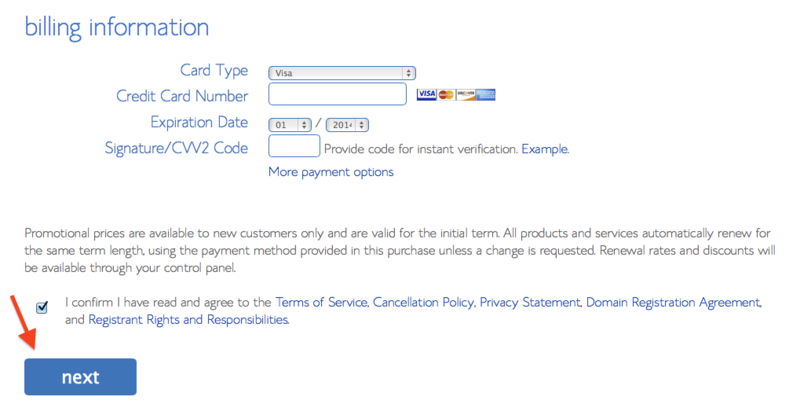 All you need to do is put your payment information into the secure checkout form, read and agree to the Terms of Service, and click next. Congrats! You’re now an official domain owner and super close to having your niche job board up and running. Now you’ll need to install WordPress. 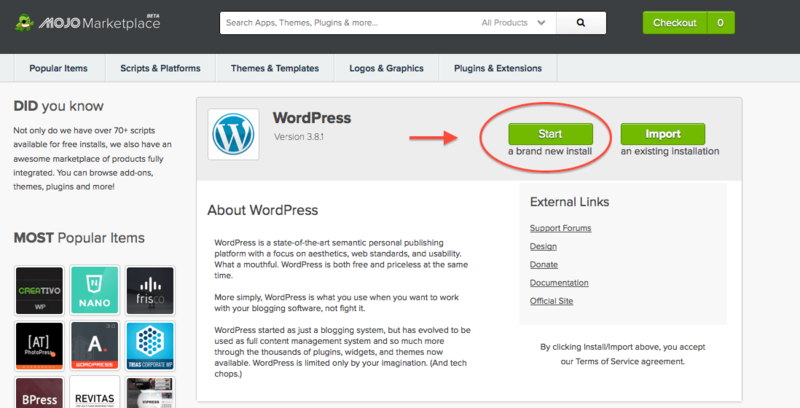 Navigate to your cPanel and find the “Instal WordPress” button like the one in the screenshot above and click on it. You’ll be given more information about how awesome WordPress is and also be able to start the installation process. When you’re ready, simply click the “Start” button as circled above. Make sure your domain name is listed in the box and hit “Check Domain.” This ensures WordPress is being installed on the domain you just purchased. That’s it. You’ll see Status: Installing and then a success message — you’ve now got your own niche job board with WordPress installed. Now what? There are thousands of WordPress themes out there. The theme is what gives a WordPress site it’s overall look. Themes can be easily installed in just a couple of clicks. But before we get to installation, you need to actually pick a theme. Head on over to ThemeForest. Type Job Board WordPress into the search box. You’ll be presented with some really great themes that are specifically built to give you a beautiful and functional job board. 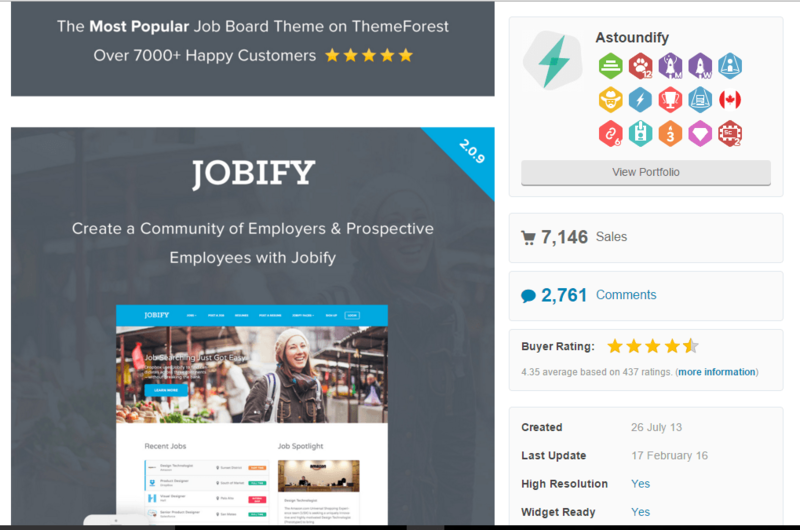 Jobify is great because of the support that comes with the theme. 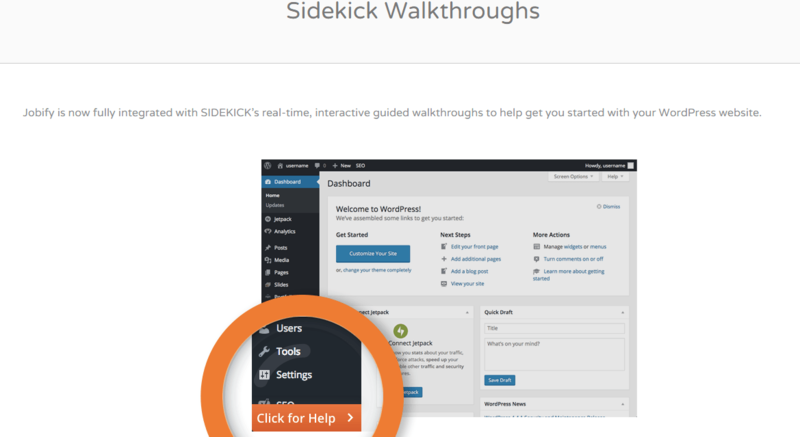 When you purchase Jobify, you get SideKick Walkthroughs. These step-by-step instructionals can walk you through just about any task. When you purchase Jobify, you get an entire year of access to SideKick premium — for free! 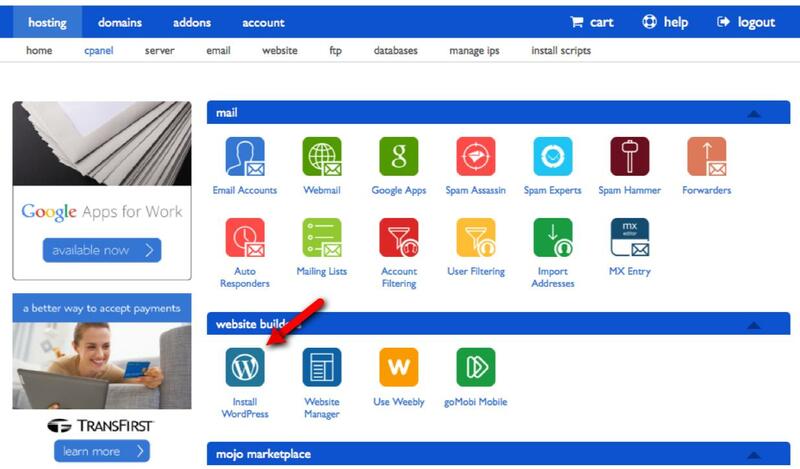 On top of the 24/7 help and guidance, Jobify also integrates with all the great job board plugins you’ll need to monetize your site right out the gate. Which Plugins Do I Need? WordPress plugins complement your theme. They also provide specific functions to your site without having to write a single line of code. 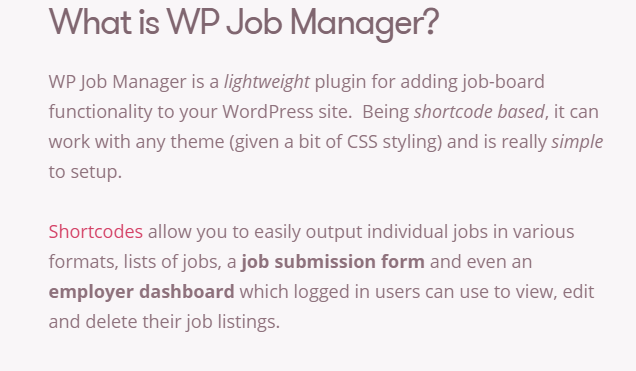 The main plugin you’ll need is WP Job Manager. This is a free plugin that gives you a functional job board that allows employers to submit jobs and job seekers to easily search through your job board. But if you want to monetize your job board, you’re going to need premium plugins. These cost money. At the very least, you’ll need Simple Paid Listings. With Simple Paid Listings, you can charge a flat fee per job posted. Employees can pay through Stripe or PayPal before their job goes live. The cost of Simple Paid Listings is $19. 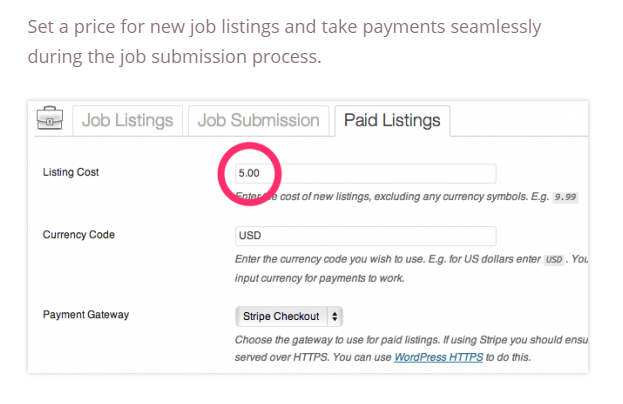 Having this plugin allows you to easily accept payments from employers when placing a job on your site. There are some other pretty amazing plugins you can purchase to help build different revenue streams — this includes Indeed Integration, WC Paid Listings, and Resume Manager. You don’t need these plugins. But they do expand your job board and give you different ways to monetize. For example, with Resume Manager you could charge candidates to upload their resumes to the database or charge employers to browse through resumes in search of candidates. When just getting started, you may want to seriously consider the Indeed Integration plugin. Why? Your job board will look pretty empty at first. When you have the Indeed Integration plugin, your job board will be backfilled with listings from Indeed. This gives the illusion of an active job board even when you haven’t sold your first listing yet. And the best part is, you can sign up to be an Indeed Affiliate through their Job Roll program. This lets you make money every time you refer a user to Indeed who then generates revenue for them. Pretty cool, huh? It’s a great way to make passive income just for having Indeed jobs listed on your board. The Indeed Integration Plugin is $39. 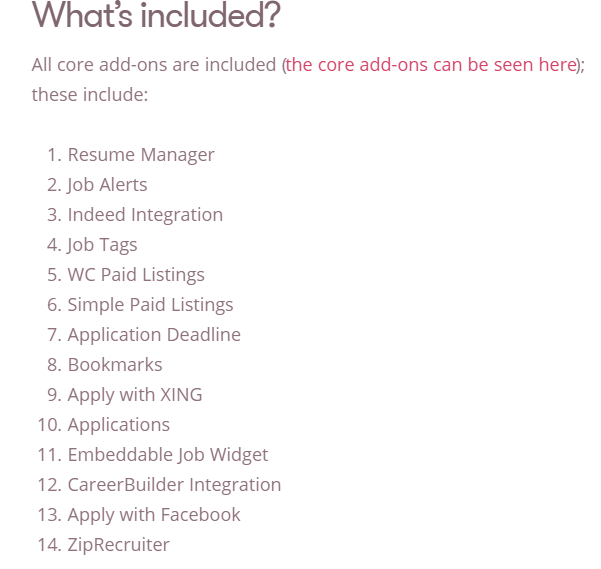 If you think you may purchase two or more plugins to go with your job board, you may want to buy the Core Add-On bundle. At $125, the Core Add-On bundle gives you all of the money-making plugins already mentioned and some other valuable ones as well but at a greatly discounted price if bought separately. I’ve got the Core Add-On bundle and use it here on Work from Home Happiness. You can see what it looks like by visiting my Job Board and the Upload a Resume page. While this may seem like a huge, time consuming undertaking — a theme to pick out and plugins to install — it’s really not! 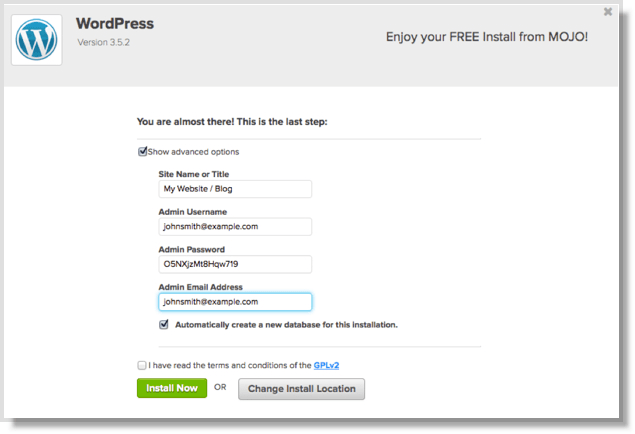 In fact, Jobify and the recommended plugins can easily and quickly be installed. And, if you run into any trouble, remember, they all come with great support and documentation — it really is the no-fail way to get a job board set up quickly, easily, and frustration free. While I suggest you do the work yourself, so you get a really good feel of how to navigate your site as an Admin, you can have someone do the installation and setup for you. Fiverr has some amazingly talented freelancers who can get your site up for as little as five bucks. So, if you’re really not the DIY type, know you can outsource the work. Good post. Of course anyone can start a job board but you have to be goo d at internet marketing in order to make it successful. I think it can bring in supplemental income for part time bloggers. To get employers to post jobs though you will need to reach out to them proactively to make real money. Thanks for mentioning the 100+ Niche Job Boards in this post! Thanks for putting this together and sharing this Ashlee. This is great information and I’m passing it along. Thanks for the help! How does the site actually make money for you though? Thanks for stopping by — and great question. You can charge employers to post job ads or you can even charge job seekers to post their resume so employers can find them. If you maintain a blog, you can also get companies to sponsor posts. But probably the easiest way to monetize is charging to place job openings on your job board. Some niche job boards charge $300 or more for one 30-day ad! This was a GREAT article. I’m pondering creating a job board and this has helped me immensely. Thank you for putting it together. I just need to figure out my niche. Currently reading everything I can on starting a job board and putting together my plan. Do you have any suggestions for existing marketing plans that target employers? What are some of the best ways to contact employers and get them to list their job openings on your site? Email, phone calls, marketing proposal? First, this was a very helpful. I followed most of the steps over a year ago, but have delayed launching my site. I am facing a very specific issue and would like any advice you have to offer. As I mentioned, I have been working on a Job Board for over a year now. I am stuck at the point where I need to convince employers to post jobs, or convince job seekers to visit my site. Without Jobs posted, job seekers will not visit my site. Without job seekers visiting my site, I will not get employers to post jobs. What is the first step to achieving one or the other? I can’t charge any employer to post a job to a site that hypothetically went public yesterday. I can’t generate traffic because the site has no jobs posted. It’s like a catch-22, Chicken or the egg sort of problem. Any advice? This great! I had an idea for a niche job board about a year ago but the process of getting it off the ground has been slow. The ideas you present here are a huge step up. I had no idea this was possible! I’m super excited to get a community job board going. What’s the best way to get employers to buy? Reach out via email? Also, if I don’t gave metrics and analytics to show how many potential applicants might visit, how can I earn trust? It’s a good article about building a job board website. I do recommend wp job manager all together it’s a very good plugin and i am using it on my website and it’s working fine. Like I always say about your content, awesome and this time I’ll add outstanding! You nailed it Ashlee, makes me think of a different way for an income source. Thank you so much for sharing this awesome guide. I recently built a job board using Job Monster wp theme which cost me $80. The site looks great now with the design & I’m much happy with it. You can reach it here: http://www.JobyPlace.pk . Again, Thank you so much for sharing this epic guide. Great info!!! If i already have a wix site ..can i incoperate this job board there? I’m sure you could! I know there are a number of third-party apps made just for Wix sites. Chances are, there is one that will work for a job board. If not, you can create one (or hire someone to create one!). That’s why I recommend WordPress to launch a job board site — there are so many, amazing plugins and themes that can transform any WordPress site into a pretty and functioning job board with ease. Good luck! Let me know if you need any help. I think wordpress is the best platform to build a job board easily and there are many wordpress job board themes out there like Jobify, Workscout & job career but the most important things is to me it successful. Thank you for the great post. I have several question In regards to building a job board. I’m a Career Developer and Business Service rep. For a local city in So. Cal. I actually have several ideas that I would like to implement for my job board and and think I will need a open source platform. Do the hosting sites you mentioned above allow open source options? What is the best way to find technical assistance for my site? I actually would love to find someone to help me build my job board . I have created IT niche job website in Pakistan but it is not growing fast. What do I do ASHLEE? I personally drive traffic to my job board through SEO, social media. I reach employers through email marketing. Thank you so much for this nice guide. Thanks . Hope your business is doing fine. Is this a wordpress website? How about google sites? Are they any near with respect to apps and stuff to the wordpress? Thank you for the long detailed article about job site ,I want to ask you which resume services are best to integrate in my local job portal site.Thanks in Advance. Thanks for your advice. Enjoyed reading your blog, I have been having a hard time in my decision making of whether to or not to run a directory site based on work involved and profit return. With this advice am more courageous to go ahead. Great article! I’m currently working on my own niche job board. It’s a project management job board. Great article, it helped me a lot starting my niche job board for the blockchain industry! So, I’m In the process of creating a new job board. This is a very special job board but since I can’t afford to make my job board how I want I decided to go a cheaper route and make a normal job board. I found a niche but I have a few problems. I tried reaching out to a few colleges and trade schools but they all told me no because they already have job placement services for their students. I know that not everyone gets a job straight after graduating so I thought it was strange that they turned down my offer. How do I get clients for my job board?